Tenable Network Security transforms security technology for the business needs of tomorrow through comprehensive solutions that provide continuous visibility and critical context, enabling decisive actions to protect your organization. Tenable eliminates blind spots, prioritizes threats, and reduces exposure and loss. Transform security with Tenable, the creators of Nessus and leaders in continuous monitoring. 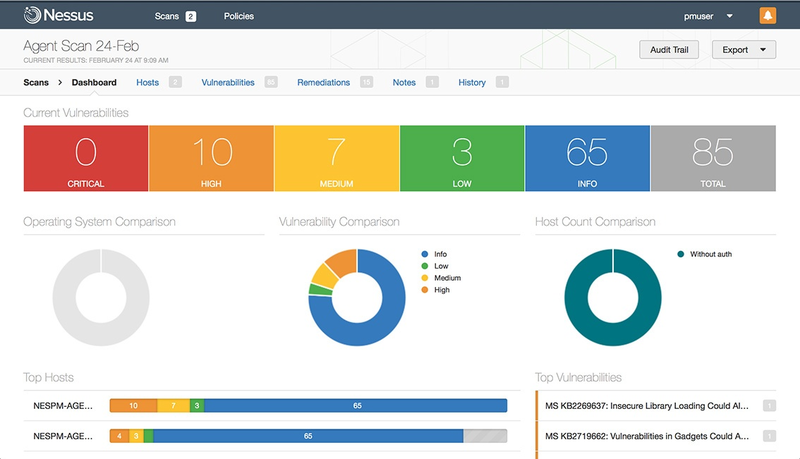 Nessus, the industry-leading vulnerability scanner, has been adopted by millions of users worldwide. Nessus discovers all assets on your network -- even hard-to-find assets like containers, VMs, mobile and guest devices – and informs you clearly and accurately about their vulnerabilities and prioritizes what you need to fix first. Nessus is available as both a cloud and on-premises vulnerability scanning and management solution. SecurityCenter leverages Nessus Scan data and consolidates it into an easy to understand management console. Dashboards and reports tell you what’s most important to know and why it matters so you can prioritize remediation. Assurance Report Cards enable you to benchmark and report on your risk and compliance posture. Combine the detection, scanning and auditing features of Nessus with extensive management and collaboration functions. Add multi-user support, agent-based scanning and pre-built integrations to Nessus in an easy-to-deploy cloud-hosted package. Extensive experience in vulnerability management and vulnerability scans. InfoGuard has highly qualified Tenable Engineers and experienced penetration testers. Did you ever want to see your network through the eyes of an attacker? You can benefit now by ordering our Vulnerability Management Service online now!